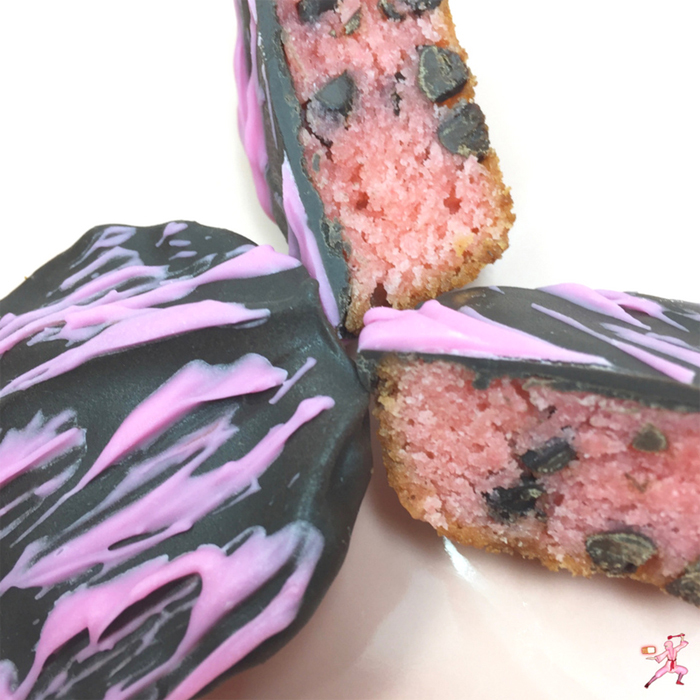 Pretty Pink Chocolate Blondies are a delightful dance of blondies, chocolate chip cookies and chocolate covered strawberries. Melted chocolate can be temperamental. However, employing dark chocolate candy melts made the task of icing the blondies easy. This recipe is adapted from Wendy Sondov’s TheMondayBox.com . Wendy has great tips for sending blondies in the mail. Break the white chocolate baking bars into chunks. Place in a microwave safe bowl with the butter. Melt the white chocolate and butter together at one-minute increments on medium power. Stir. Keep melting in the microwave at 10-second intervals until completely melted. In a kitchen stand mixer, beat the eggs for 3 minutes or until foamy and frothy. Slowly, pour in the sugar and jello powder and vanilla. When incorporated, stir in the melted chocolate butter mixture. Add the flour and salt. When combined well, sprinkle in the mini chocolate chips. With a mini (2 tablespoons) ice cream scoop the batter into the muffin tins. Bake for 10 minutes or until a toothpick inserted in the centers comes out clean. Cool for 5 minutes in the pan. Gently loosen with a frosting spatula from the pans. Do not let the blondies remain in the muffin tin. Prying out the hardened blondies will be more difficult. Once the blondies are completely cooled, melt the dark chocolate candy melts. I like using a double boiler. But the microwave works, too. Dip the blondies into the dark chocolate. Place them on a cookie sheet lined with waxed paper. Refrigerate for 10 minutes or more. Melt the pink candy melts in the microwave or using a double boiler. Drizzle the chocolate-coated blondies with the melted pink candy melts. Chopsticks and/or small forks are fantastic drizzling utensils.